Within the product you can split test two different Designs, Alias' or Subject Lines. 1. Select Split Test from the Email Tab within the Campaign you would like to be a split test. This section will explain the different rules you can set for split tests. Percentage- This will change depending on what sample size metric you have decided to use, this example will show the percentage. If you have select actual the text next to the single line text box will change and will allow you to enter the number of contacts that you would like to send to. Send method- If you would like to select the winning design manually, which can be done through the view results option on the campaign screen select manual. If you would like to it to be automatically select auto send. If you select the AutoSend option you will be able to set the hours and days when you would like the split test to be over. Select if you would like the remainder of the split test to go automatically or manually. If you choose AutoSend then you must enter a time frame and a criteria you would like the system to select the winner based upon. If you choose manual then a user has to initiate the remainder of the split test whenever they are ready. Alias 1 - This is the Tab ID, which is text that shows on the web browser when the 'view online' link is clicked. Design 2- Select the second design that you would like to use for the split test, the design does not have to change and you can use the same design as design 1. Alias 2 - Tab ID for when the 'view online' link is clicked. Sender Alias 2- Enter the sender alias that you would like to use for the second email. Subject line 2- Enter the subject line that you would like to use for the second article. 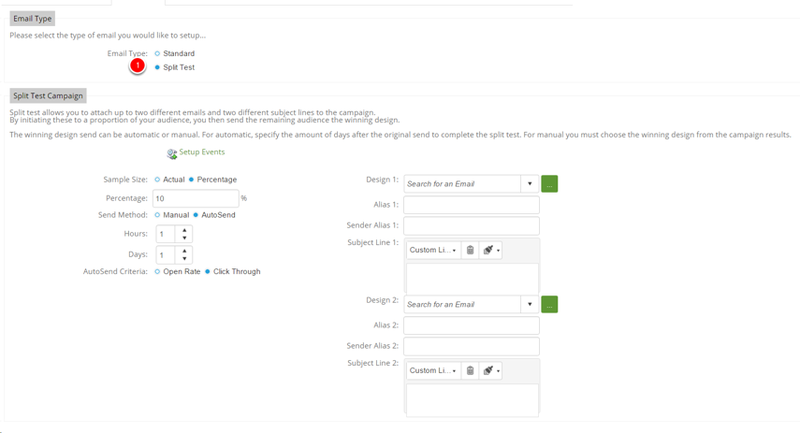 Setup Events- If you have event blocks included in the design you can select the events that you would like to include in the send by clicking on the setup events button.